Technetium 99 (99Tc) is an isotope of technetium which decays with a half-life of 211,000 years to stable ruthenium 99, emitting beta particles, but no gamma rays. It is the most significant long-lived fission product of uranium fission, producing the largest fraction of the total long-lived radiation emissions of nuclear waste. Technetium 99 has a fission product yield of 6.0507% for thermal neutron fission of uranium 235. Technetium 99m (99mTc)is a short-lived (half-life about 6 hours) metastable nuclear isomer used in nuclear medicine, produced from molybdenum 99. It decays by isomeric transition to technetium99, a desirable characteristic, since the very long half-life and type of decay of technetium 99 imposes little further radiation burden on the body. Due to its high density, excellent absorption behaviour against radiation and environmental friendly characteristics, tungsten alloy can be widely used to produce Technetium 99 tungsten radiation shielding. 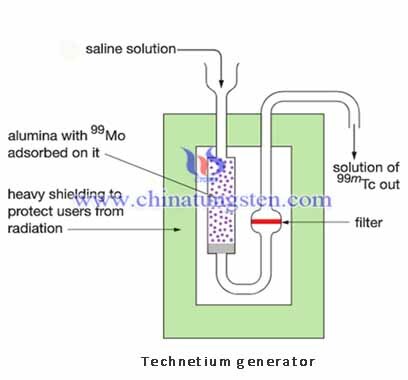 Technetium 99 tungsten radiation shielding usually be used in nuclear medicine, which as the radiation shielding and container for Technetium 99m. 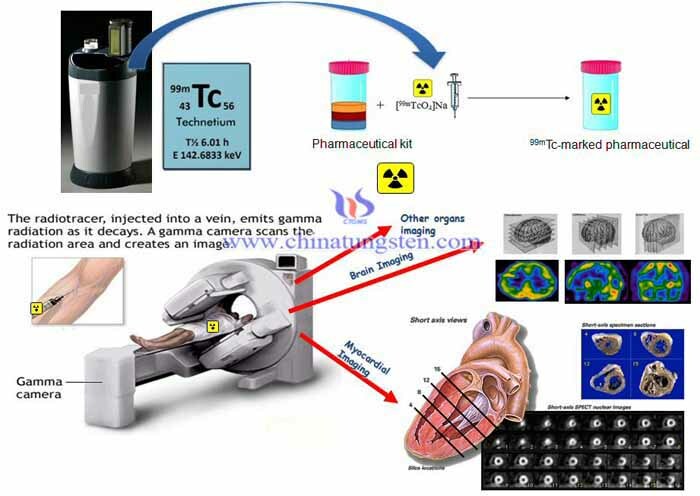 Technetium 99m is used as a radioactive tracer and can be detected in the body by medical equipment (gamma cameras). Technetium 99m allows for scanning procedures which collect data rapidly but keep total patient radiation exposure low. The same characteristics make the isotope suitable only for diagnostic but never therapeutic use. Tungsten, which is a hard and rare metal and often exists in the form of chemical compound, serves as an efficient lead replacement material. Tungsten alloys have high density and hardness, in fact almost 60 percent higher than lead, which are desirable characteristics for radiation shielding applications. They can be used to mitigate X-ray and gamma rays. Other benefits of tungsten-based materials include their high temperature resistance and environmental friendly. During design of shielding, tungsten alloy radiation shielding is calculated according to requirements of shield to abate the multiple shielding materials' thickness. please feel free to contact us at sales@chinatungsten.com sales@xiamentungsten.com. Or call: 0086 592 512 9696, 0086 592 512 9595.